GMI is a project that was created by Social Asset Measurement (SAM) and the Carleton Centre for Community Innovation (3ci). 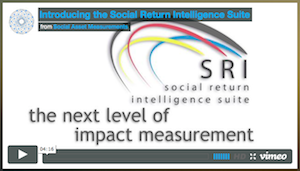 It brought together 3ci’s ten plus years of expertise in impact measurement, and SAM’s impact measurement software, the Social Return Intelligence platform (SRI). SRI has been reviewed and accepted by the UK based international SROI Network, and has been funded by the National Research Council of Canada. GMI provides participants with educational webinars and are walked through the process of creating their own impact measurement framework. They are then able to access the SRI software to continuously report on their impact. To find out more about GMI, please join us for a free webinar Sept 4th at 12PM Eastern. If you want to strengthen your evaluation capacity and try out SROI or other outcomes frameworks, GMI might be right for you.